AgriGarden Distributor s introduce the FD280 Collection Ride On Mowers. The out-front floating deck of these ride on mowers has been designed to allow operators to mow into corners, under bushes and trees. Because the deck follows the contours of the land, the mowers produce a quality finish which results in a beautiful looking lawn. Offering excellent visibility, the FD280 collect 280 litres of grass, as much as commercial machines. Their unique deck shape and blade design produces excellent airflow, which eliminates grass blocking. The three bladed cutting system and direct rear collection, operates without the need for fans or impellers. 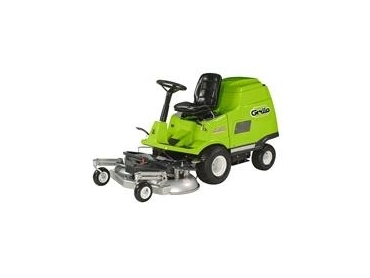 The electric grass discharge takes out all the hard work of emptying the grass. The 46” out-front deck of the FD280 offers excellent visibility and reduces mowing time dramatically. The FD280 ride on mowers feature differential locks to increase traction, a pivoting rear wheel axle to increase stability over uneven ground. The parallelogram deck support keeps the cutting level uniform at all cutting heights. The latest FD280 model features an electric clutch to engage the blades as well as a quick release lever to enable the cutting deck to be released so that it can be raised to the vertical position for easy maintenance. A hose washing port allows for easy deck cleaning after use.